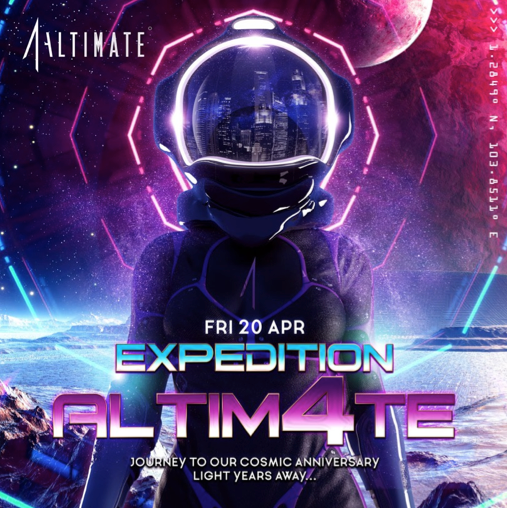 For its fourth birthday, Singapore’s highest indoor nightclub Altimate is set to go all out, we’re talking infinity and beyond, with a multi-sensory celebration that takes night revellers to cosmic space! Dizzy with blinking lights, pulsing beats and extraterrestrial vibes, the club kicks off with a string of hypnotic tunes from resident DJs such as Rattle, Lorri and Emcee Boo, plus a special guest DJ Tay James who has spun for pop star Justin Bieber for over eight years. Keeping to the galactic theme, Altimate will also serve up a special anniversary cocktail Cosmic ($16), featuring a potent mix of vanilla vodka, parfait d’Amour, pineapple and lemon juice with soda. The birthday bash takes places on 20 and 21 April (from $40 per pax) from 10pm till late.